look at this catnapper on the couch. 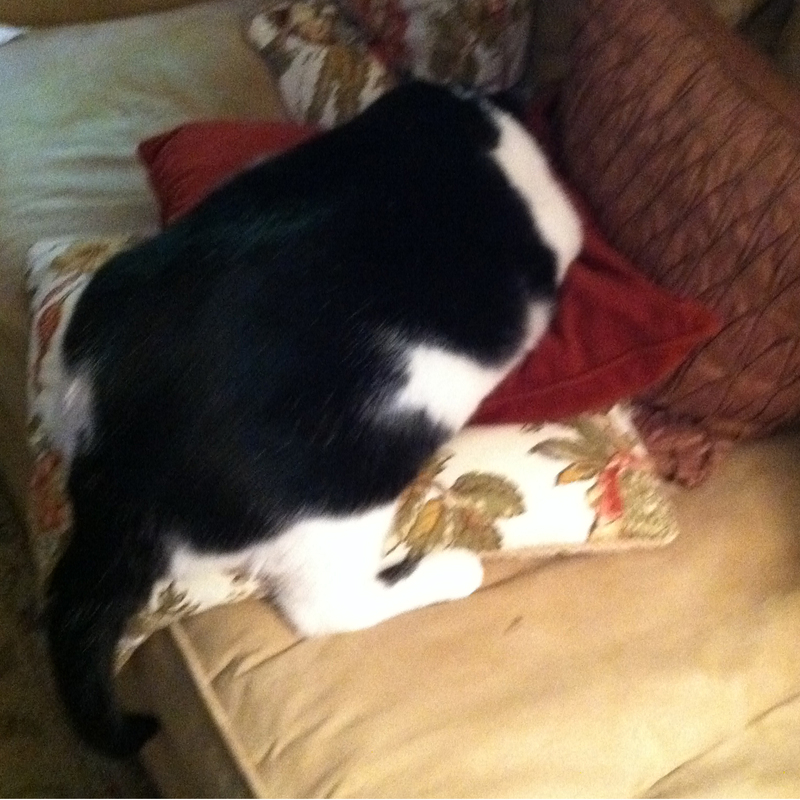 i think he needs a few more pillows! that’s just how i like to take my naps- pile on the pillows and blankets. the more pillows and blankets, the more i can dream about my favorite thing, food! and boy do i have something to dream about today- i smell grilled tuna steaks simmering in marinade. mom makes it with minced ginger root, honey and a garlic clove. and then she tops it off with a cup of dry sherry! i’m like a character on TV, popping my eyes out when there’s a piano about to fall on them or they see a pretty girl. my eyes pop out when i see dinner. tonight’s a real eye-popper, linguini with clams and chopped anchovies, extra-virgin olive oil and crushed red pepper flakes, cooked in dry white wine. oh boy, my eye are bouncing in my head and my tongue is doing somersaults! Fuddles sighting at the doctor’s office! 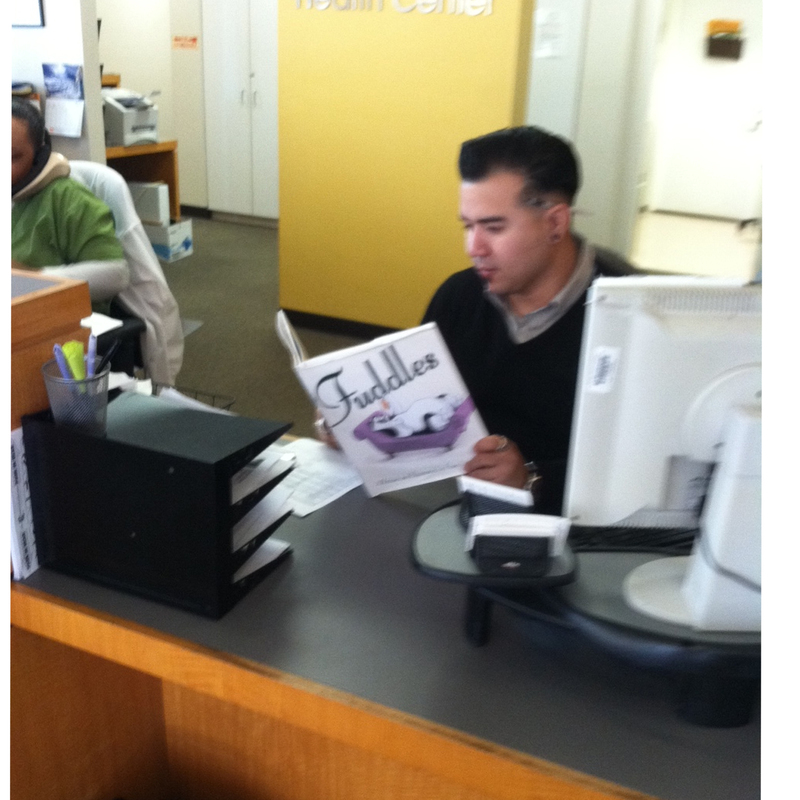 frans went to the doctor and the receptionist was reading fuddles! yay! i don’t like going to the doctor’s so i stayed home and took a nap. i have to build up an appetite because we’re having barbequed baby back ribs for dinner with apple cider buttermilk dipping and smoked paprika and a side caesar salad and chocolate ice cream for dessert! i’m a general searching for new lands to conquer. i traipse all over the backyard, looking for intruders to banish. i trounced a fiendish mole and sent him retreating back into his hole. and the dastardly squirrels that try to steal my avocados- they beat a hasty withdrawal to the oak tree. i travel on my belly, eating off the fat of the land. and boy, i’m ready to eat! i can smell the ratatouille cooking through the kitchen window. mom makes it with eggplant and petite-diced tomatoes and chopped flat-leaf parsley and a dash of dry white wine. bon appetite! I’m always a bit impressed with children’s books that are written and illustrated by the same person. 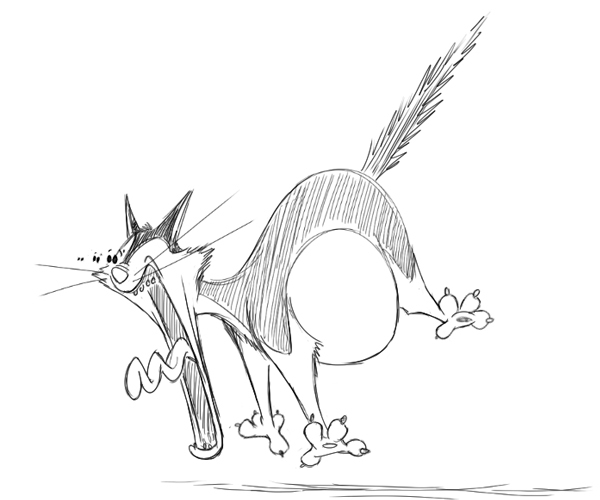 Frans Vischer works as an animator at Disney and Fuddles , intended for children ages four to seven, is his first picture book. He has modeled Fuddles after his own pet. Fuddles is a spoiled house cat who dreams of being a great adventurer and so sneaks out of the house one Sunday afternoon. He soon finds that the great outdoors isn’t at all as he imagined it would be and as darkness settles, he finds himself lost and scared. Vischer’s illustrations have an almost water-color quality about them. During Fuddles’ time indoors, the cat—he is a BIG cat—dominates the pictures. Outdoors, the spaces are bigger and, by nightfall, we know Fuddles is good and lost. This story is a valuable moral lesson for young children in the importance of ‘listening to mom’ and being happy where you are. Four stars. yay! this review makes me so happy that i just want to eat! i can sniff dinner from the kitchen- we’re having meatloaf with italian sausage, chopped onions and worcestershire sauce! 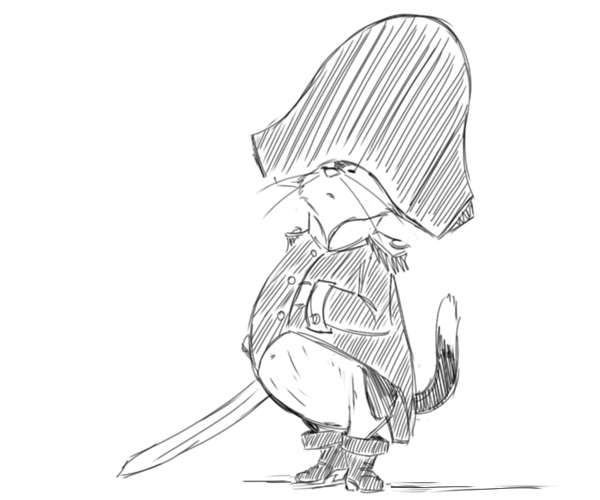 i’m a pirate with my captured booty! i stormed the beach from my pirate ship and fought back the bushes and twigs and thorny twines with my dagger. it was a vicious fight, but i’m a blood thirsty pirate, and i got the loot! 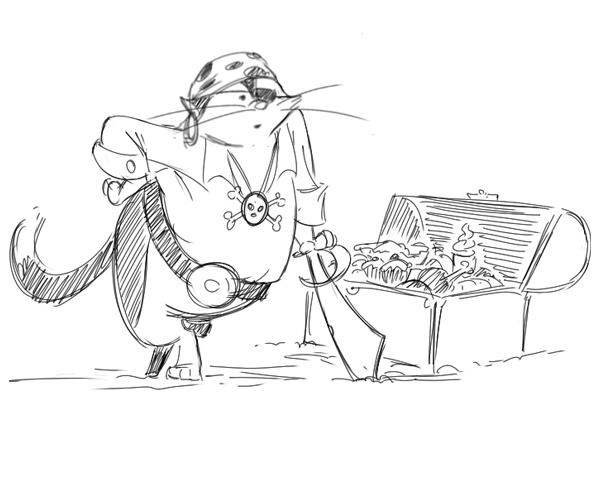 actually, i’m a thirsty pirate. and a hungry one too, so i’m gonna eat my booty now, starting with a hunky barbequed turkey leg with gravy, followed by a chocolate cupcake with lemon frosting! 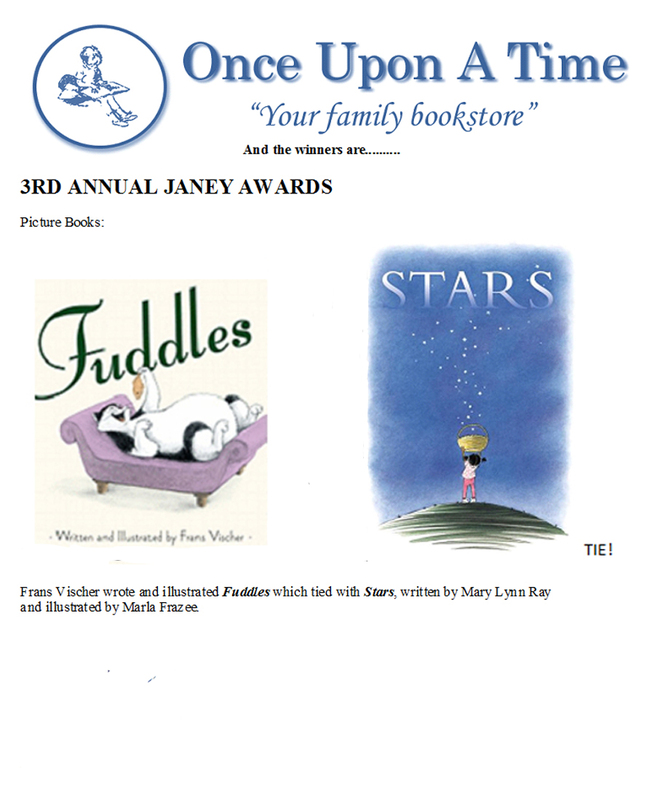 Once more- Fuddles Ties For Janey Award! yay! another big cheer for fuddles! i’m so happy it’s making me hungry. tonight it’s a burrito-fest, with lots of guacamole and sour cream and chips and salsa and hot sauce and…i’d better stop or i’ll faint! 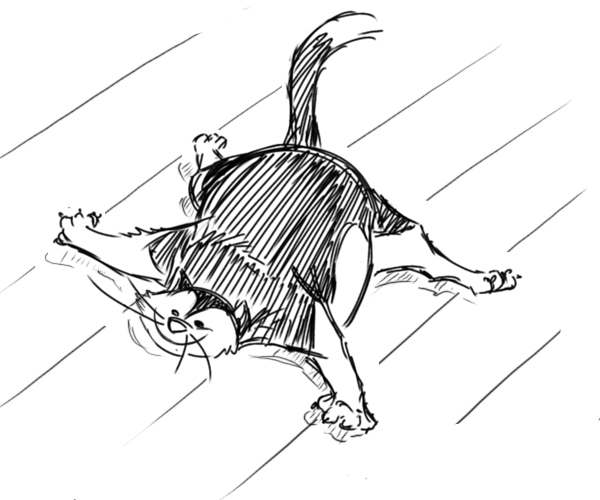 when mom cleans the floor it gets all shiny and slippery, and i love to go sliding around the house. i pretend i’m doing a floor routine with lots of people watching and beautiful music blaring as i swirl around the couch. i can’t make myself stop, so i smash into the walls and furniture, and my tummy just bounces me right back. all that bouncing makes me so hungry, and we’re having fish sticks with really tart tartar sauce tonight! and chocolate chip ice cream with hot fudge for dessert! oh boy! Fuddles Ties For Most Popular Picture Book! 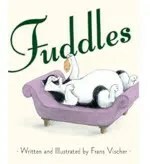 Frans Vischer wrote and illustrated Fuddles which tied with Stars, written by Mary Lynn Ray and illustrated by Marla Frazee. yay! i’m so excited i could eat a 7-course meal! and i think i will- we’re having duck a l’orange tonight, with ground coriander, i don’t even know what that is, but it sounds yummy! also thyme sprigs and orange juice. oh boy, what a meal to celebrate my picture book win!